nesdev.com • View topic - Glory of Heracles IV - SNES Translation fix? Post subject: Glory of Heracles IV - SNES Translation fix? 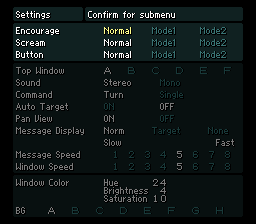 Post subject: Re: Glory of Heracles IV - SNES Translation fix? Should of said emulator....snes9x works great. Figured there is a byte that needs changed somewhere or something. Here is what it is doing when I put it on eprom. Emulator is is fine. This is the menu that pops up when you hit the start button in game. snes9x and zsnes are phenomenally inaccurate emulators, and there's at best a minimal correlation between "works in either" to "works on hardware". How big is the ROM file in bytes? Is it an even multiple of 524288 bytes (4 Mbit), or is it a multiple of 524288 bytes plus 512 bytes? Newer emulators don't need 512-byte headers that were added by obsolete floppy disk-based copiers. If it has the copier header, chop off the first 512 bytes in a hex editor and rename the file to end in .sfc (headerless Super Famicom ROM image), as opposed to a copier-specific extension such as .smc, .swc, or .fig. I ran into this not too long ago. ON REAL HW, you must use 128K sram, not 256k, not 64k. It's a "protection" scheme the hacker did. I made this on RHW and it works fine. What donor has 128k? Can't seem to locate one. I used a 256k one on the dev. Tie A14 on your 256 kbit SRAM to ground. Correct but pull it out of circuit so A14 isn't connected to the buss, then ground it. Thanks, will give it a try here in a few.